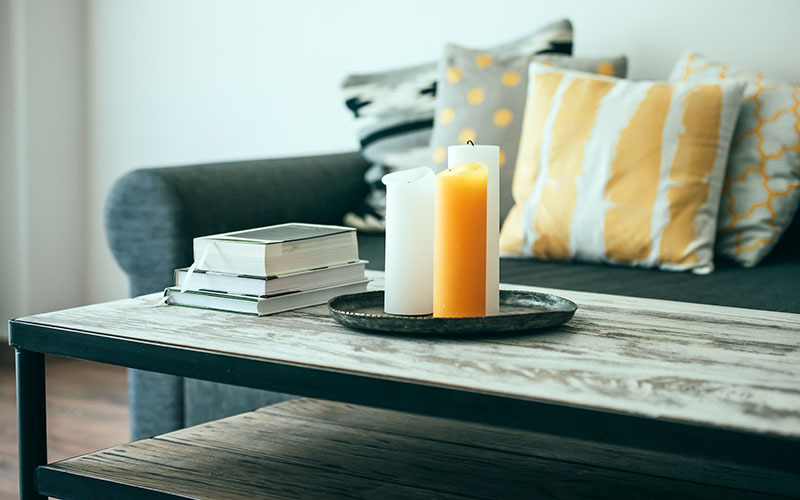 Decorating is the best way to express your style while making the most out of the space you have, and let’s be honest, that is not easy when working with a student budget. But fear not! There are indeed budget-friendly DIYs and decorating tips that make the most of apartment living — even when your income is basically non-existent. If storage is not your apartment’s strong suit, then maximizing space is essential. Look for anything and everything that has extra drawers to store odds and ends. The best way to maximize space in and around your living space is by making sure your side tables double as storage units. Think function can’t be fashionable? Paint the storage container two complementary colors to match your style or decorate the top to disguise the table’s true purpose. Whether you are creative or creatively-impaired (like me), making your own art is an easy and cheap way to decorate your apartment. 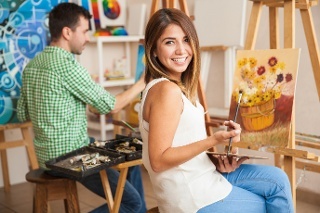 If you are the creative kind, then all you need is a canvas and a paint brush, and you’re set. If you are creatively-impaired, there are plenty of fun tutorials and templates all over Pinterest. After all, good artists borrow, great artists steal. Bringing in natural design elements can transform your apartment. Love the beach? Find seashells and drift wood elements. Prefer hiking? Scavenge some wood and place small plants around your space. Fill jars with items from your nature walks or other outdoor jaunts. 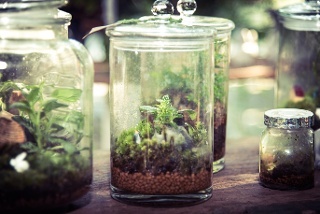 Small terrariums are beautiful and bring instant life to a space. Books and Candles. Candles and Books. I mean, do you really have decorations if these two items aren’t involved? It seems simple, but the addition of these two items can take any space from drab to fab. Candles add the perfect amount of coziness, and favorite books bring character. You can find books at any thrift store or second-hand shop, and we all have plenty of leftover science and history textbooks from last semester. (It may not be the most interesting read, but it gets the job done.) And if you are in a dorm room and candles are not allowed, simply use fake LED candles for the same effect. Long gone are the days when mixing patterns was a big no-no. Mixing patterns — like ikat and stripes — adds texture and character to a dorm room or a studio apartment. Stay in the same color scheme if you’re worried about pairing hounds tooth with polka dots. Once you feel bolder, pop online and search the colors that complement each other and start mixing patterns outside your comfort palette. Your Instagram and Facebook are filled with pictures from summer break and fun parties. 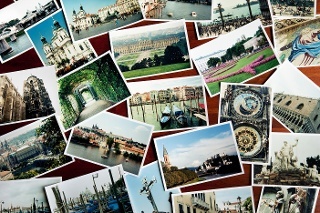 But your apartment seems barren of all memories, and you just can’t find room in your budget to splurge on frames. When in doubt, use your college and Spring Break photos as a tabletop decoration. 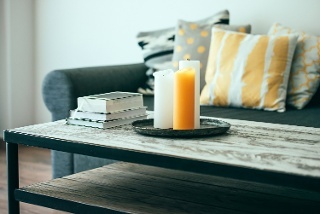 If your wooden coffee table or desk has glass on top, simply lift it off and place pics underneath. Or, if your tabletop does not have a glass top, use Mod Podge to attach your photos. If you have a local thrift store or second-hand shop near you, utilize it. Not only is it cheap, but sometimes you can find really great pieces that add just the right amount of character to your home. 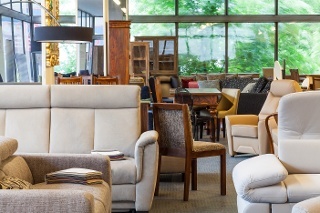 Most thrift stores even have older furniture — which can be transformed and made new if you know what you’re doing or have enough imagination. P.S. If you are handy or you have someone in your life that is good with power tools (Dad? 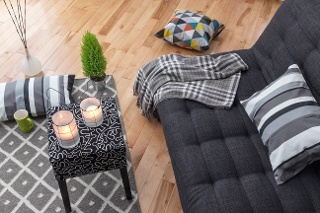 ), take an old chair from the thrift store and create a side table for your bedroom, or combine three to four chairs and create a unique bench for your kitchen.